The scandals mounted quickly. From 1920 to 1923, Secretary of the Interior Albert B. 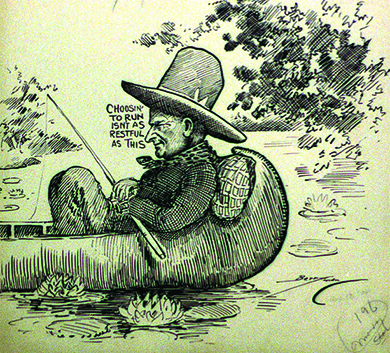 Fall was involved in a scam that became known as the Teapot Dome scandal. Fall had leased navy reserves in Teapot Dome, Wyoming, and two other sites in California to private oil companies without opening the bidding to other companies. In exchange, the companies gave him 100,000 and sentenced to a year in prison. It was the first time that a cabinet official had received such a sentence. This cultural battle between the forces of reaction and rebellion appeared to culminate with the election of 1928, the height of Republican ascendancy. 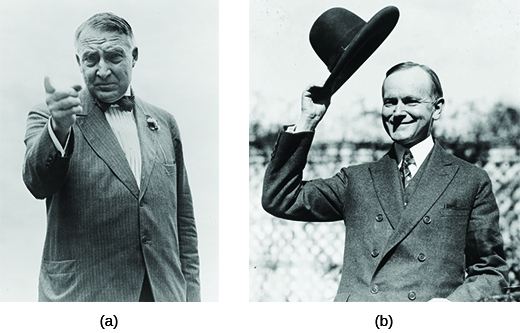 On August 2, 1927, Coolidge announced that he would not be participating in the 1928 election; “I choose not to run,” was his comment ([link]). Republicans promoted the heir apparent, Secretary of Commerce Herbert Hoover. The Democrats nominated Governor Alfred E. Smith of New York. Smith represented everything that small-town, rural America hated: He was Irish, Catholic, anti-prohibition, and a big-city politician. He was very flamboyant and outspoken, which also did not go over well with many Americans. Republican Ascendancy: Politics in the 1920s by OpenStaxCollege is licensed under a Creative Commons Attribution 4.0 International License, except where otherwise noted.